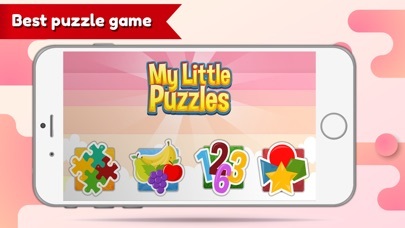 My Little Puzzles is a free kids puzzle game from ages 1-5. kids can learn shapes, fruits and can solve jigsaw puzzles playing this free game. 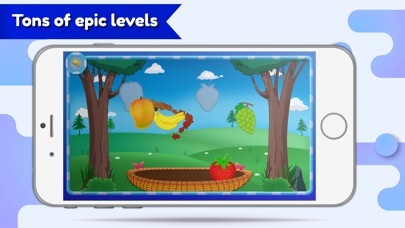 With hand-made beautiful Shapes, Fruits, Kangaroos and amazing jigsaw puzzles for kids all in one game. This game offers a Colorful Learning Experience. Your Kids will definitely love this puzzles game! It improves Kids Cognition and Pattern Matching abilities. - MAIN FEATURES - * 4 Different Mini Games all in One Game! * Increasing difficulty of Puzzles so it stays relatively Challenging as your Kid learns. * Beautiful Hand Tuned animations and Sound Effects. * Soothing Background Music - TO THE PARENTS OUT THERE - We would definitely LOVE your Feedback regarding our kids puzzles game, as we will keep improving this puzzle game and Your reviews/ratings will be a huge boost to our Morale. If you have any Suggestion or Feature request, feel free to send us an Email or leave a Review. Finally, Have fun with the Game and Help your intelligent Children develop enhanced Pattern Matching, Pattern Recognition and Cognitive skills with our free puzzles for kids. So let your kids learn the shapes in our newest kids puzzle game.